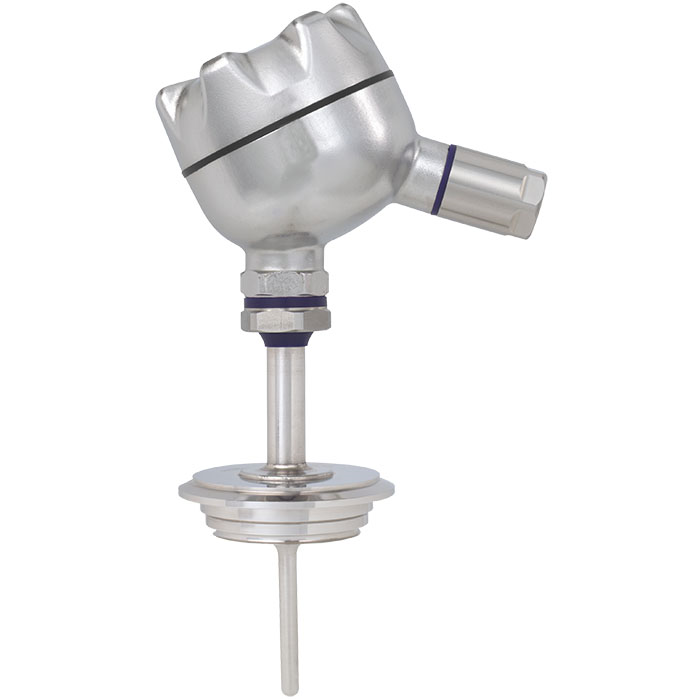 The model TR22-A resistance thermometer is used for temperature measurement in sanitary applications. The process connections meet the stringent requirements, in terms of materials and design, of hygienic measuring points. With increased hygienic requirements for the ambient areas around the measuring point, a stainless steel head is available in an optimised hygienic design. This enables easy cleaning of the measuring instrument, particularly for splash zones in food production. Due to the rotatable screw connection to the connection head, it is possible to loosen the connection head and to adjust it in the desired position. The connection head can be removed together with the measuring insert. This allows the resistance thermometer to be calibrated along with the whole measuring chain, i.e. without disconnecting the electrical connections. In addition, this avoids having to open the process, and thus the risk of contamination is minimised.